RSI - Are You At Risk? 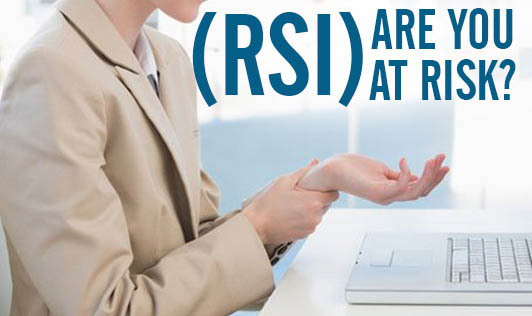 RSI in layman terms can be described as any injury caused due to repetitive activities without ergonomic care. Contrary to popular perceptions, RSI does not only affect the people working with computers. Lying down in our favorite positions to watch television, driving a car with misaligned wheels, riding a two wheeler in incorrect posture, even cutting vegetables, can cause RSI. Since we spend a large amount time in front of computers, the perception about RSI has grown. Do you use a computer for more than 2 hours a day? Do you work continuously on repetitive tasks without breaks? If you feel you are prone to RSI and do not recognize the symptoms, the following symptoms should help you make a preliminary diagnosis. Lack of strength in the arms. E.g. : It is now harder for you to cut vegetables or open jars. Massaging affected part sub consciously. If RSI has affected your hand, you will tend to avoid using the affected hand and may want to use the other hand, feet or shoulder to open or close doors. You will also face difficulty in hooking jewellery and may want to avoid use. Remember that you are not invincible. RSI could happen to you.